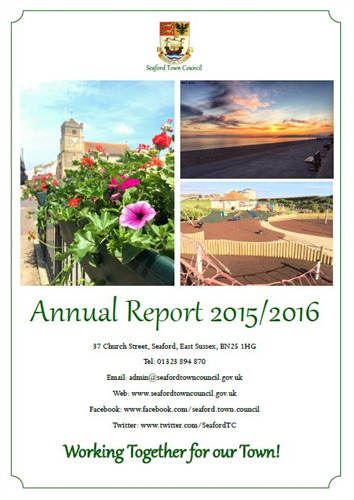 Seaford Town Council has published its Annual Report for the 2015-2016 Municipal Year, filled of updates and news from the Council. The Report can be found on the Council’s website at www.seafordtowncouncil.gov.uk/Annual-Reports.aspx or hard copies can be found in the Tourist Information Centre at 37 Church Street. The Report sets out the Mission Statement and Strategic Objectives that were adopted by the Council earlier this year and gives an insight in to the aims for the current year. As well as looking forwards, there is an update on many of the Council’s facilities and open spaces and the achievements and improvements that were made during the year.